Earlier this week, I drove down to ST Garage to sign up for the annual 1JZ Meeting, and also headed out to Umihotaru last night for the 7/7 RX-7 meeting. I took pics, but they aren’t quite ready yet. Until they are, enjoy this matte black JZX81 instead. Just like how lions and gazelles share the same waterholes in Africa, D1SL machines and kei vans sometimes share the same fuel pumps in Japan. Yuusuke Kitaoka has a boring daily driver as well, but prefers to also use his 600HP 2JZ Mark II to drive and watch his friends at drift events, visit his parents’ house and sometimes pick his girlfriend up from the train station. “It’s really embarrassing when he does, because everyone stares at us!” she said. Some of you have been asking if I have picked winners for January’s competitions yet. I haven’t picked the exact winners yet, but I’ll announce it on here when I do. 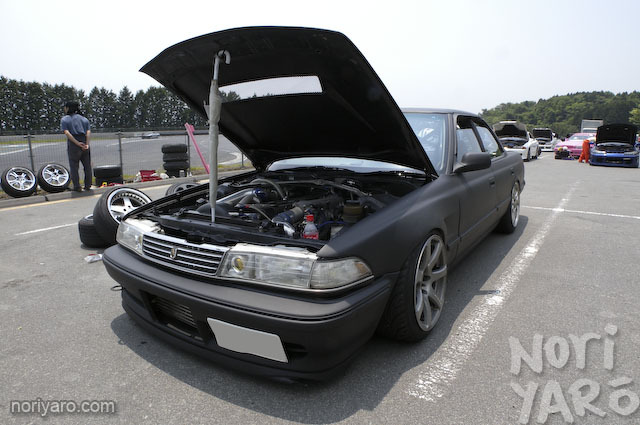 In the meantime, here’s some pics of a bunch of JZX owners who met up at the Tokyo Aqualine Umihotaru parking area recently. How about this? 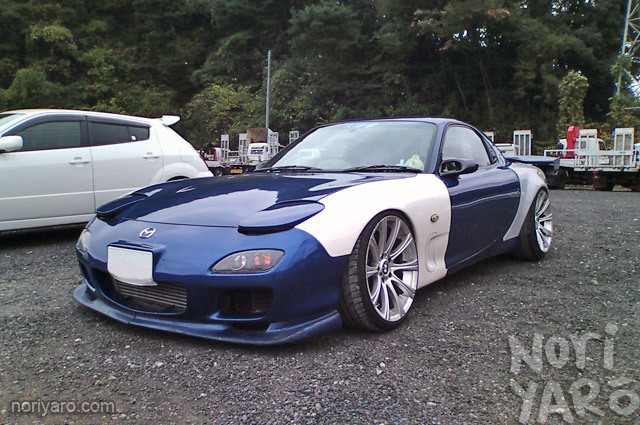 An FD RX-7 on E60 M5 wheels. 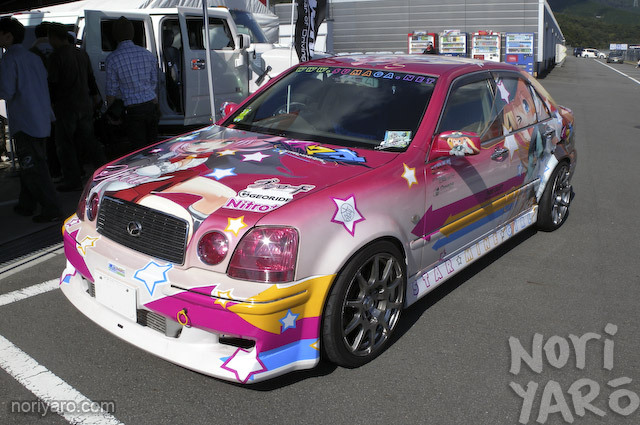 I normally wouldn’t post a pic of an itasha for no good reason, but I have one. This is actually a proper drift car. If you haven’t seen one before, the car itself is called a Toyota Progrès, and is basically a compact version of a JZX100. 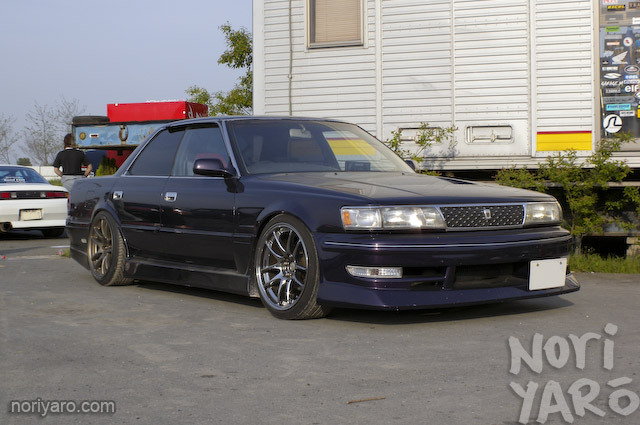 It’s meant to appeal to old businessmen, which is more or less who the JZX100 was meant to appeal to anyway, and comes with either a 1JZ or 2JZ engine. Before you get too excited, they were fitted with the direct-injection type, so this one has an engine swap. I saw it a while ago at Honjo Circuit when the body was still only wearing the pink to white faded paint. Free Craft’s Tanaka-san was giving it a decent thrashing, which made it very surprising to see it stickered up recently with images of Mira, Spica and Garnet from the adult video game “Star Mine Girl”. Apparently, Tanaka-san did it in order to attract otaku customers who want their cars done up in an itasha style, and it has so far apparently worked. I don’t know why, but I can’t wait to see this car actually out at the track. There’s something about a the idea of a car with stickers of cute animated girls on it at full lock with smoke pouring off the tyres that just seems so wrongly right.